Great value. Kitchen was nice, and beds were pretty comfy. Location was the best part. It was an easy walk from the bus station and a couple minutes walk to the castle. 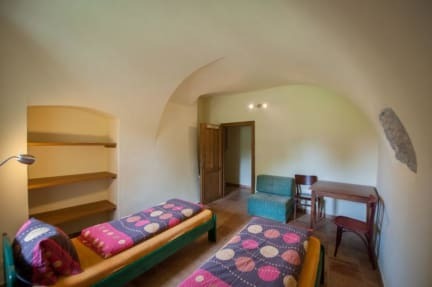 This hostel is the perfect base to explore the charming town of Cesky Krumlov. Brennan was helpful and friendly and organised rafting for us which was so much fun. We had 0 issues and I would definitely return. Great staff, convenient location, close to rail station, lovely relaxed atmosphere, excellent cleanliness. Nice hostel build in an old building. If you're almost the only one staying it may look like a haunted house. It's dark and cold although the heating. Very comfortable, clean, great owner and good kitchen with all the facilities you may need. Location is perfect, in the old Town just in the door entrance to it. This hostel was pretty good and had all of the bare necessities, however the atmosphere while I was there was very quiet and the dorms were not very secure. Having said that the beds were comfortable, the wifi was excellent and the facilities were clean! Overall, I would stay here again if it was the cheapest option! It's really dark in the room. But the staff was nice.